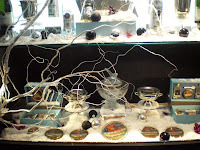 There is a wine and spirits shop in the eighth arrondissment that is worth a visit if you are interested in either: Augé, which has been in business since 1850. In addition to wines from all over France (primarily), Augé has a comprehensive selection of spirits, including their proprietary versions of famous single malt scotches. They work with leading distillers and, among other things, require them to use no dyes so the scotches look paler even though they retain the characteristics one would expect from the normal offerings by the same distillers. A wide selection of armagnacs, cognacs, calvadoses, etc. are also offered. What distinguishes Augé from many other stores is the depth of expertise to be found there. I have had almost uniformly excellent recommendations for wines and wine pairings in various price ranges from at least three of the people there. Most interesting recommendation so far: to pair with beet soup, NO WINE. Indeed, the people at Augé believe that wine simply does not go with soup (or artichokes -- this being a more commonly held view), and they say that any sommelier worth his salt will not try to sell you a wine to go with a soup appetizer. I have mentioned this to other French people, who generally seem to agree in principle (but not in practice). And it was at Augé that I discovered Drappier Brut Zéro Champagne, a lovely champagne that is made with no added sugar (and only costs about $30 per bottle). This champagne is not available in the US, but other no-sugar-added champagnes are; I will have to try one or more of them and report. If you are familiar with any of these, please let me know by commenting below or emailing separately if you are too shy. 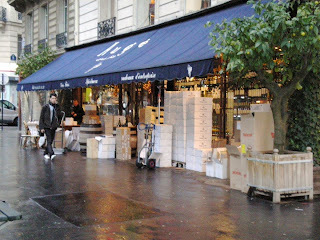 In recent years, Paris has seen a proliferation of epicerie/restaurants, where customers lunch at large tables on foods that are also available for purchase. One of the best of these is Granterroirs, 30, rue Miromesnil, about a block and a half from the elegant rue du Faubourg Saint Honoré (and the Elysée Palace). The food is excellent, and every day features one or more plats du jour and an excellent dessert du jour (see the chalk board in the photo). Also salads and open sandwiches on toasted pain poilane featuring their fine foie gras, onion confit, smoked salmon, ham and other scrupulously selected ingredients. 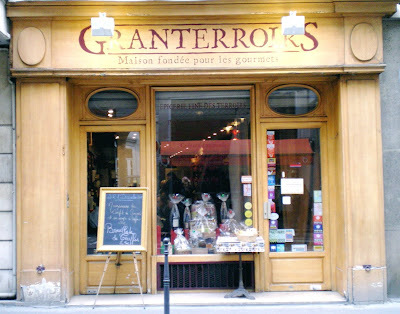 Excellent cassoulets and other preserved foods, jams, chocolates and liqueurs are also to be found, together with a selection of regional wines. I have recommended Granterroirs to many friends and the response has been 100% raves. 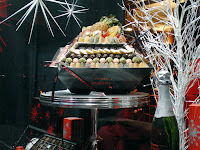 Christmas and New Year's in Paris are all about food, particularly luxury foods, such as foie gras, caviar, chocolates, fabulous pastries, vacherin de mont d'or (see my post "The Best Cheese in the World"), champagne, fine wine, etc. 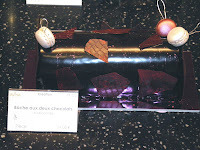 This year's offerings include numerous modern takes on the traditional bûche de noël, or Christmas log, which used to be a rustic representation of a gnarly log. 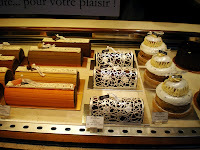 There is a real risk of sensory overload if you hang around the famous gourmet places, as you can see from the pictures below. Where but in Paris can you have an impromptu dinner like this? Having been out for dinner four nights in a row, I decided at the last minute to stay home and keep my dog company tonight. 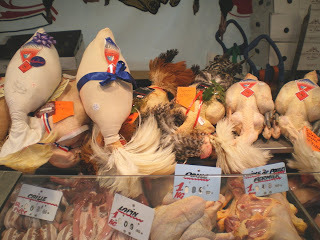 Today being Saturday, I had gone to the wonderful open-air market on the avenue de Président Wilson (16th arrondissement) in the morning and followed up with a trip to the rue de Lévis (17th) in the afternoon; as a result I had plenty of wonderful food from which to fashion a meal. I started with an aperitif of Béquinoix, which I found last summer in Perigord during a visit to our good friends' magnificent country home near Sarlat-le-Caneda. 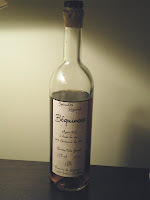 Béquinoix is a wine-based aperitif made in Perigord with walnuts (France's best, bien sûr). It has a nice fresh taste and does what an aperitif is supposed to: makes you want to eat dinner. 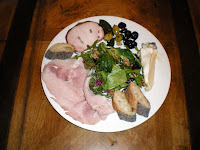 Dinner consisted of jambon aux herbes and porc rôti aux poivres verts that I got at the Alsatian traiteur on rue de Lévis, accompanied by a mixed salad of arugula, mesclun and mache with walnuts and hazelnut vinaigrette, picholine olives with laurel and coriander seeds and black olives with red peppercorns that I bought from my favorite North African olives-and-dried-fruit merchant, a perfectly runny slice of vacherin de mont d'or from Androuet (see my post "The Best Cheese in the World") and slices of a flûte pavot (poppy seed encrusted thin baguette) from Paul. 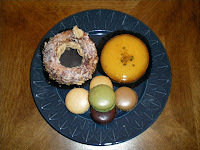 For dessert, small slices of mini-Paris-Brest and individual tarte citron from Le Petite Rose, my favorite patissier (see "Paris -- Best Lemon Tart"), and assorted macarons from the renowned Lenôtre. There's more of everything in the fridge and I even saved the whole rotisserie-roasted stuffed quail for my wife, who arrives tomorrow. Despite the presence in the French markets of produce from all over the world, I tried to use only French products for this meal. As you can see, this was no hardship. The Musée Jacquemart-André in Paris (158, boulevard Haussman, 8ème) is a wonderful museum set in a second empire grande demeure. It has an excellent permanent collection and also frequently houses well thought-out visiting exhibitions of various kinds of art. More to the point for this blog, you can have a very nice lunch or tea under a real Tiepolo ceiling (at left) in the museum's cafe. You don't have to pay an entry fee for the museum to enjoy this experience. 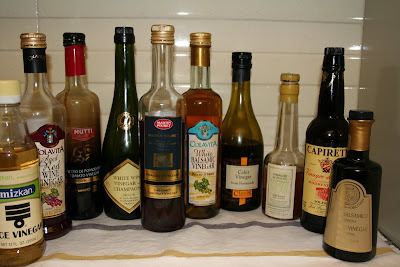 As with oils, there are a huge number of vinegars, each with a different use. I have a crazy amount of them even though I have stayed away from herb-infused ones. Fortunately, unlike oil, vinegar keeps pretty much forever. Red Wine. I keep a good Italian one (there are no exceptional ones), like Colavita. 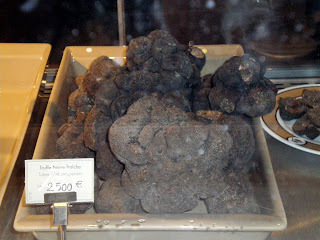 For French I use Orléans, which is available at good gourmet stores, and Banyuls, which is hard to find. Sherry. I rarely use it although many salad dressing recipes call for it. Even good quality isn't too expensive, so I buy pretty good stuff. Balsamic. I confess that I don't really like it because I find it too sweet and assertive. That being said, there are innumerable recipes that call for it so I keep decent quality stuff and cut it by at least 1/2 with red wine vinegar. Sometimes great amounts of cheap stuff are called for, and I'll just buy a bottle. 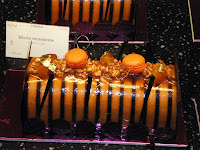 The really great stuff is another thing altogether, being complex and syrupy rather than sweet. Great just drizzled over vanilla ice cream! There is a pretty nice and inexpensive (because not aged long at all) condiment called white balsamic vinegar. Worth experimenting with. Tomato. I love tomato vinegar, which is vinegar made from tomatoes and not a flavored wine vinegar. This inexpensive product, which is made by a company called Mutti, can be found, with difficulty, in NY (they have it at Kalustyan's). I use it blended with red wine vinegar in salad dressing (1 part tomato to 2 or 3 parts wine). It adds body without the sweetness of balsamic. Champagne. Many recipes call for this. It is easy to find and not expensive, so recommended if space permits. Cider. Another one that is frequently called for in recipes. Keep some if you have room. Get a French one, not Heinz or equivalent, unless you need tons of it. Rice or Rice Wine. Necessary for Asian and Asian-inspired cuisine, such as miso salad dressings. Interesting vinegars make nice house gifts when you are invited to dinner. If you are really rich, bring the very old balsamic vinegar; otherwise any one that sounds interesting. 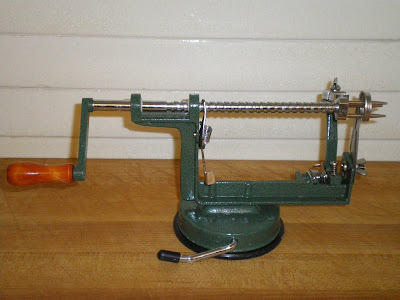 This is not a device for torturing small animals, but rather a gadget that really is great at what it does: a pèle-pomme trancheur (apple peeler/slicer). You insert the apple and crank; in approximately 2 seconds, you have uniform, peeled 1/4-inch apple slices, ready to be sautéed or put on a crust and made into an apple tart. I bought mine (a Matfer) in France but have seen them in the US. I saw one at Bed Bath & Beyond (made in Asia and priced below $20) that allows you to core and slice without peeling, or to peel without slicing, but I stupidly didn't buy it and haven't seen it again. The only downside of this item is that it is what Alton Brown calls a uni-tasker and takes up precious kitchen space; so resist the urge if you don't peel and slice a lot of apples. 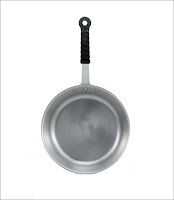 I recently bought a Vollrath Tribute 14" frying pan, and I love it. It is stainless steel-clad aluminum, and heats quite evenly. This is great if you are browning beef, lamb or veal, or sauteing a whole chicken, and don't want to overcrowd the pan, or are preparing a lot of kale or other greens that otherwise spill all over your stove until they melt down. This line of pans comes with a soft insulating handle rated at 450 degrees, so it can go into the oven. And it's not that heavy despite its size, although a bit big for flipping. Inspired by One-Knife Woman's comment to my post "The World's Greatest Chef's Knives? ", I am writing this post a bit ahead of schedule. I apologize for the length of this post, but there is a fair amount of ground to cover. First, one must understand the difference between sharpening and honing. Sharpening, which involves removing part of the steel of the knife's blade, is done rarely, while honing, which realigns the microscopic teeth on a non-serrated blade, should be done pretty much each time you use the knife, with a sharpening steel. Norman suggests getting your good knives sharpened once a year by a professional. He recommends Henry Westphal Co., Inc., located at 11 West 25th Street, which does the sharpening off-site in a couple of days, and Broadway Panhandler. 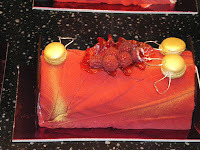 I used Henry Westpfal and found them to be very good. The guys who come around on the street (or are in front of Zabar's) may or may not be good. Norman is not a fan of electric sharpeners, including the Chef's Choice (which I used until I met him). As far as what kind of knife to use, in our class we used forged Wusthof Classic knives: (i) a 10-inch chef's knife, (ii) a 8-inch chef's knife, (iii) a 6-inch "sandwich" knife, (iv) a 10-inch serrated knife (for carving, bread, tomatoes, etc.) and (v) a 3 1/2-inch paring knife. We did not use boning knives; that is for a different course. The point of using both the 8-inch and the 10-inch chef's knives was to let us conclude, as we all did, that the 10-inch is better in all respects; the extra heft actually makes cutting easier. The 6-inch sandwich is a great utility knife. There are other, more expensive Wusthof lines but the difference is with the handle, not the blade, so you choose. Wusthof (like Henckels) uses a high carbon stainless, which stays clean but is soft enough to hone with a sharpening steel. 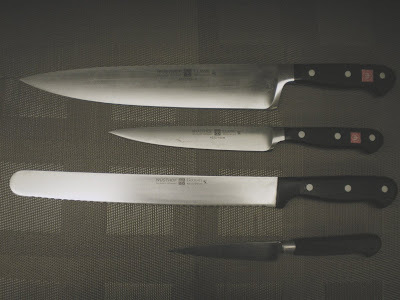 Speaking of steels, make sure you get one that is 2 inches longer than your longest knife, i.e., a 12-inch steel if you have a 10-inch chef's knife. You want to hone with a 20 degree angle (eyeball just 1/2 of 90 degrees and then a little less than 1/2 of that); Norman recommends holding the steel vertically, point on a towel on the counter, so you can make sure the angle is good, and I endorse this approach. That being said, I recently took a cooking lesson in Paris at Atelier Guy Martin and the chef was raving about the Shun knives, which he described as the Rolls-Royce of knives (and which they happen to sell at the Atelier). They use excellent Wusthof or Henckels knives in class. To summarize, get a Wusthof 10-inch chef's knife and, if you have the money, a 6-inch "sandwich," together with a 12-inch sharpening steel. Use the steel frequently, and get professional sharpening once a year. A good bread and paring knife are great, too. If you have a santoku or Japanese knife and are happy with it, enjoy. You can get Wusthof knives at discount prices at Broadway Panhandler and Henry Westpfal and through various on-line sources. 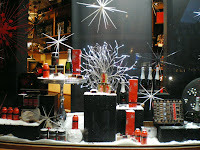 If you prefer to pay list price, there's always Williams-Sonoma. Other tips and pointers? What about comments on Shun knives or santokus? 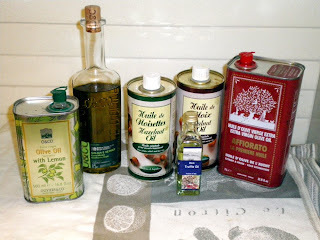 I find that I use a number of different oils, for different purposes. Vegetable. I use canola because it is lowest in saturated fats, but peanut, grape seed and corn are fine. All have relatively high smoking points and lack any distinctive taste. Olive. Volumes could be written on this subject. I use four kinds: (1) excellent quality Italian extra virgin, for finishing and special Italian salad dressings; (2) excellent quality French extra virgin, for finishing and French salad dressings; (3) good Italian extra virgin (I like Fairway's Pugliese) for everyday use, but not frying; and (4) cheap or non- extra virgin Italian for sauteing (apparently all the aromatic subtleties of an extra-virgin oil disappear when it is brought to high enough heat to saute). There are great olive oils made in Spain, Greece, Morocco, Australia and California which may substitute for the ones listed above. Hazelnut. I use this all the time in salad dressing. See my post "Elegant Arugula Salad." Probably good drizzled over the right cheese, but I haven't worked on this yet. Walnut. I don't use often, but there are recipes for walnut and apple/pear salads that feature this. This is also probably fine sprinkled over cheese and walnuts. Lemon/olive. This is a great product made of olive oil and pressed lemons rinds; it is not just lemon flavored. I love it over mozzarella and over simply steamed or boiled artichokes. Sesame. For that Asian flavor, generally by itself or with rice vinegar. I love it sprinkled on top of a raw avocado. I buy my highest quality French and Italian olive oils and lemon/olive oil from O & Co. (at Grand Central Market and elsewhere), where you can taste before buying. I'm sure there are many, many other great oils but O & Co.'s are reliable. There are of course many infused oils, but space limitations make it difficult to keep many of them. Notables are truffle oil (great over a toast covered with parmesan shavings), hot pepper oil (great over pizza or pasta), garlic oil (ditto) and various herb oils, such as basil, rosemary and mixed herbs (great to drizzle over mozzarella and tomatoes. The great chef Bobby Flay just uses a blender and makes herb oils as required for his recipes. In addition, there are a number of very specialized, delicious oils that I don't keep but that are worth buying if a really good recipe demands, for example pistachio oil and argan oil (a very expensive but wonderfully nutty oil made from the nut of the argan tree, which grows only in Southern Morocco). Scented and specialty oils make excellent house gifts for people who like to cook, as do any really excellent oils (or vinegars . . . but that's another post). The World's Best Chef's Knives? The November 24 New Yorker has an interesting article by Todd Oppenheimer on Bob Kramer's hand-made kitchen knives, which are apparently the best in the country, if not the world. The article may be found at www.newyorker.com/reporting/2008/11/24/081124fa_fact_oppenheimer. A quick look at his web site confirms that Kramer is so back-logged that he's not taking orders. Let me know if you have used, or even seen, one of Kramer's knives.